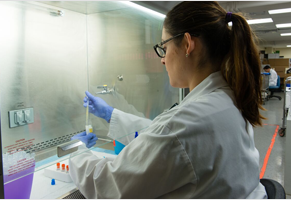 The CRLB provides scientific, analytical and biorepository support for large multinational clinical trials and epidemiologic studies. The CRLB is a 12,000 sq. ft. facility which supports the research of the Population Health Research Institute (PHRI), as well as independently contracted clients, with accessioning, reception, storage and analytical areas. CRLB has vast expertise in the shipping, receiving, storage and analysis of large numbers of samples from more than 85 countries representing every region of the globe. The CRLB occupies approximately 12,000 ft2 with accessioning, reception, storage and analytical areas. 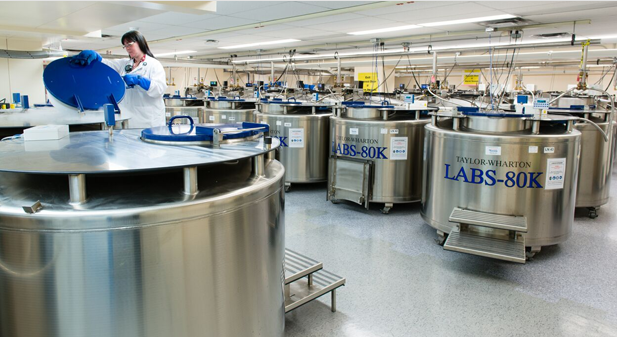 The Biobank has expanded to house 60 large nitrogen vapor storage tanks (each with the capacity for 60,000- 80,000 vials) housing several million specimens. These specimens are stored in nitrogen vapor at ~-160oC which is supplied to the freezers via an automated bulk tank and pipeline delivery system. Eventually the facility will house 80 to 100 large nitrogen vapor storage tanks. Mechanical freezers store specimens at -70°C and -80°C, including several hundred thousand whole blood specimens applied to filter paper. The facility is on generator backup (tested weekly) and is monitored 24 hours a day, 7 days a week by the CryoMORE system (Air Liquide) for nitrogen freezers, and Accsense wireless system for mechanical freezers, humidity and facility temperature. The CRLB facility is access restricted to authorized personnel and access to the Laboratory Information Management System is password-protected and restricted to authorized personnel. All operations within the CRLB are governed by Standard Operating Procedures and the Quality Management System. The specimens collected for studies in which the CRLB has collaborated have been collected, processed and stored according to standardized protocols based on best practices. All laboratory instructions are written to meet the standard of specimens processed to derivatives and frozen within 2 hours of collection. These specimens have been stored for up to 18 years. 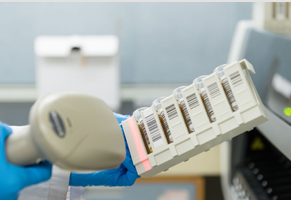 Each sample is barcode labeled and data are collected on temperature and duration of storage at the site of collection, mode and duration of transport to the CRLB and conditions from the time of reception and storage at the CRLB until use. In addition, each study retains data on all of the variables collected for each patient from whom specimens were collected and can be linked by that investigator to the blood sample results. The only unique identifiers known by the CRLB staff during handling and analysis are barcode numbers; all other data are kept by the Principal Investigator of each study. The CRLB electrical facility is on generator backup (tested weekly) and is monitored 24 hours a day, 7 days a week. 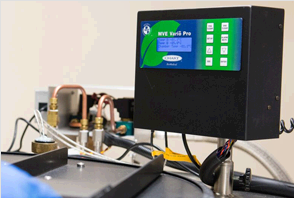 Mechanical freezers are monitored through the Accsense wireless system, while the nitrogen facility including all freezers are controlled and monitored by the CryoMORE system. Both systems send alarms to the local CRLB staff, as well as staff located remotely within Ontario and Italy should a problem occur. Ambient temperature and humidity are also monitored through the Accsense system in select areas of the CRLB (specimen reception, analytical and nitrogen storage facility). If the facility should become locally inaccessible, the specimen collection can be protected by remote initiation of nitrogen freezer filling. Individual tank monitors are set to tolerances to dictate autofilling with liquid nitrogen through a pipeline fed from the bulk tank. CryoMORE stores the data derived from the monitors on each individual nitrogen tank (variables such as tank temperature, nitrogen level and fill time) as well as facility sensors on a dedicated server. The storage vessels and environmental control system have been installed with a high degree of redundancy in the event a freezer or freezer monitor should fail. 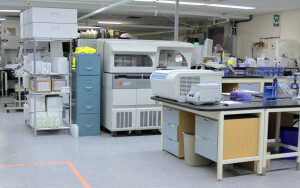 The analytical capabilities of the CRLB are constantly expanding; current analytical capabilities include routine and specialized chemistry, hematology, coagulation, specialized lipids and lipoproteins, 15 cytokines and growth factors, markers of microbial and viral infections, DNA and RNA purification using automated analyzers, and ELISAs. The Laboratory establishes and validates every test prior to testing of research study samples. Close collaboration with the HRLMP (70 MD/PhD) provides a wealth of local expertise for new assay procedures. There have also been analytical collaborations with colleagues in Canada, the United States, China, India, Germany and Australia. The tests performed within the CRLB are based on client requirements. An updated list of historical and current tests is provided on the CRLB Analytical Tests page.